Within private equity real estate, assets are typically grouped into four primary strategy categories based on investment strategy and perceived risk. Those four categories are core, core-plus, value-added and opportunistic. The key differentiator between these categories is the risk and return profile. Moving between those strategies is a bit like stepping up the ladder in terms of taking on more risk, and in theory, being compensated for that risk with a higher return. For this article, we will describe each category and outline the typical level of leverage (see Leverage: The Double-edged Sword of Real Estate Finance) used for each category but also acknowledge that the use of leverageLeverage is the use of various financial instruments or borrowed capital to purchase and/or increase the potential return of investment. Assume a buyer puts 20% down on a $5M property. Essentially, they paid $1M to own something worth $5M. Assuming the property appreciates at 5% per year, the sponsor’s net worth would grow to $5,250,000 in a year. Had they... More is determined by lenders and borrowers and, therefore, can vary from the ranges discussed below. CoreCore commercial real estate investments are the least risky offering. They are often fully leased to quality tenets, have stabilized returns and require little to no major renovations. These properties are often in highly desirable locations in major markets and have long term leases in place with high credit tenants. These buildings are well-kept and require little to no improvements... More: Core assets, considered the safest, sit at the bottom of the risk-return ladder. Core properties are relatively stable assets in major metros, such as high-rise office towers or apartment buildings downtown locations in New York City, Chicago, San Francisco, Washington D.C. or L.A. They are usually best-in-class properties in the best locations, with high, stable occupancy and credit tenants. Core assets can be quite large and expensive and, therefore, are usually owned by well-capitalized entities, such as REITs and other institutional investors. Because they are stabilized and already achieve market rents, there is not much value an investor can add, which obviously limits their upside. However, in an economic downturn, they are usually the last to lose tenants. As a result, due to a lack of value-addedProperties are considered value-add when they have management or operational problems, require some physical improvements and/or suffer from capital constraints. By making physical improvements to the asset that will allow it to command higher rents – remodeling the kitchens in multi-family, installing more energy efficient heating systems in a medical office, etc. – improve the quality of tenants and increase... More opportunities that also offer a low risk profile, core investments usually translate to single-digit annual returns. Core-PlusCore-plus commercial real estate investments are known as “growth and income” investments. The cash flow is less predictable, but they often predict a higher rate of return than core investments. 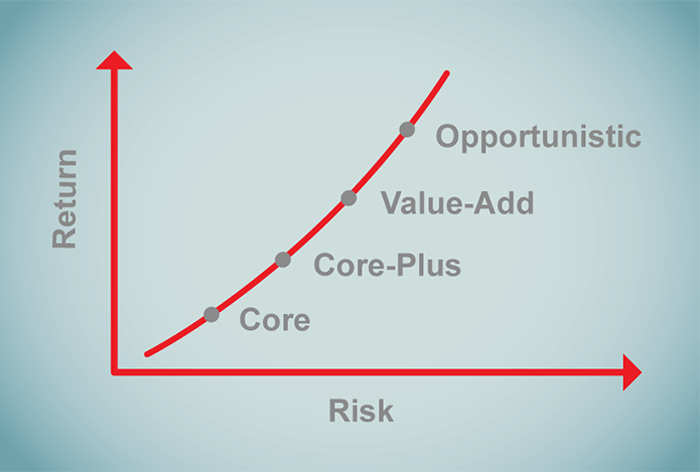 The term "core plus" was originally defined as "core" plus leverage. Leverage is the use of borrowed capital to purchase and/or increase the potential return of an investment.... More: Core-plus strategy assets occupy the next rung in the risk ladder. Core-plus assets may share many of the same characteristics with core assets with one or more exceptions that create added risk. Some examples of those exceptions might include the age or condition of the asset, a dip in tenant credit or less than stellar location. For example, that Chicago office tower might be two or three blocks off Main & Main, or it might be a historic building rather than new construction. Annualized leveraged returns on these assets are generally range from 10% – 14%. Leverage with Value-added: 65% – 85% of asset value. Unleveraged returns on Value-added assets are now high enough to entice additional use of leverage to further enhance leveraged returns. In addition, re-tenanting and repositioning strategies, as described above, can often be mostly capitalized through additional leverage that is funded by the senior lender post closing as the business plan is proven out. In industry jargon, we refer to this as “future funding” or “good news money”. OpportunisticOpportunistic real estate investments are the most high risk/high reward investment opportunities, requiring major development work. Opportunistic properties tend to need significant rehabilitation or are being built from the ground up. They have the chance to reach the highest rate of return for investors, but they little to no in-place cash flow at the time of acquisition and have the... More: Opportunistic assets are the final rung at the top of the risk ladder. These deals are generally extreme turnaround situations. There are major problems to overcome, such as major vacancy, structural issues or financial distress. Sometimes referred to as Distressed Assets, Opportunistic strategies may involve acquiring foreclosed assets from banks or servicers or acquiring the senior loan at a discount from banks or servicers with an eye toward eventual foreclosure. Opportunistic investments were plentiful in the wake of the recession as bold investors stepped in to buy properties in distress at a steep discounts from previous trades. In some cases, opportunistic deals require special expertise to execute the turn around or patience to wait out a downturn in the market to effect a value-added strategy once tenant demand begins to resurface. Because opportunistic investments carry the highest risk and require the greatest expertise, they can provide annualized leveraged returns of over 20%. It is important for investors to understand the risk and return relationship when discussing the four different types of real estate investment strategies. The level of the return should be commensurate with the amount of risk. Specific to value-add and opportunistic deals, investors also need to keep in mind that the expertise of the sponsorIn commercial real estate, the sponsor is an individual or company in charge of finding, acquiring and managing the real estate property on behalf of the partnership. The sponsor is usually expected to invest anywhere from 5-20% of the total required equity capital. They are then responsible for raising the remaining funds and acquiring and managing the investment property’s day-to-day... More and their ability to create and execute a business plan can be critical to the success of a project. A well-balanced commercial real estate portfolio may include some or even all of these different investment categories depending on the risk tolerance of the individual investor. The CrowdStreet Marketplace posts offerings across the risk spectrum in each of these categories.